Thank you for purchasing your new tires from us! In the unlikely event of a tire recall or other safety notification, it is important that we have your contact information in our file. Registering Your Tires is Fast and Easy. 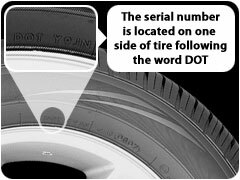 IMPORTANT: In case of a tire recall, we can notify the tire purchaser ONLY if we have the completed name, address and correct tire identification number(s). Please ensure all information entered is complete and accurate. We respect your privacy: This data will only be used in the unlikely event of a recall. We will not use this information for commercial purposes.